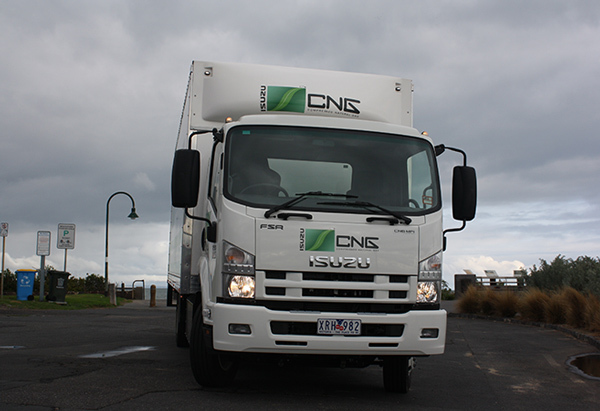 With natural gas-powered (LPG) trucks sidling more and more into view, Matt Wood takes the Isuzu Trucks FSR 850 CNG for an ‘environmentally friendly’ spin along Melbourne’s Beach Road. The Isuzu’s FSR850 CNG natural gas-powered engine seemed to enjoy sitting low in the rev range, and felt quite ‘torquey’ at metro speed limits between 60 and 80km/h. In an effort to improve community relations between the transport industry and the cycling community I decided to showcase Isuzu's environmentally friendly, natural gas-powered FSR 850 CNG, by taking it for a jaunt round Beach Road. With the van body adorned with pretty pictures of tree leaves and snazzy green sign-writing it did kind of look like a mobile environmental billboard. I nearly even wore a lycra bike outfit myself just to get into the spirit of the exercise, but as it tends to make my physique look like a handful of raisins wrapped in glad wrap, I, perhaps wisely, decided against it. Natural gas as an alternative fuel appears to be gaining a bit of momentum on the world stage with countries from the Indian sub-continent to East Asia, Europe and the Americas all looking at growing their gas-powered fleets. In fact it may come as a surprise to some that the biggest user of compressed natural gas (CNG)-powered vehicles in the world at the moment is actually Pakistan with 2.74 million units on the road. Even though Australia has more than a bit of this largely methane-based gas floating around under our water and soil, with some estimates on our reserves ranging from 150-400 years' worth, to date, we have been slow to adopt natural gas technology. Things may be in the process of changing however as upward pressures on fuel costs, as well as carbon pricing and emissions, are making our home-grown happy gas look more and more attractive. Toll Ipec placed an order for 42 CNG-powered Isuzu FSR rigid van bodied trucks recently, bringing their gas-powered fleet up to 70 vehicles. Of course the fact that there's now a CNG retail outlet within a couple of kilometres of Toll Ipec's Altona depot in Victoria helps things along nicely. 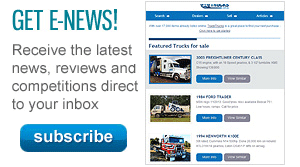 TNT has even dipped their toe in the water with a couple of CNG-powered trucks operating out of their Canberra depot. 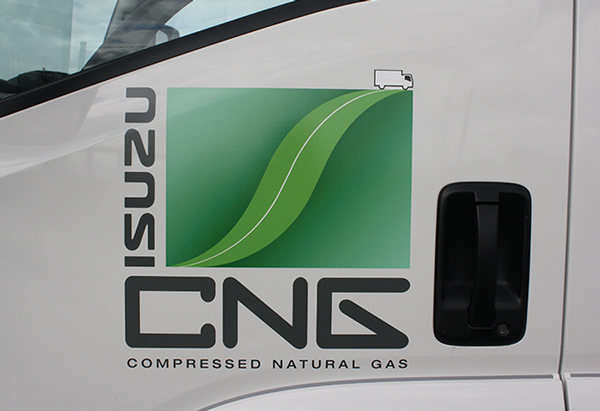 The main things to point out with natural gas are the differences between CNG and its close cousin liquefied natural gas (LNG), with both becoming increasingly attractive as a heavy vehicle fuel. Basically, natural gas can be compressed into gas form becoming CNG or cryogenically cooled until it becomes a liquid becoming LNG, in a similar process to the liquid petroleum gas (LPG) that we're all familiar with. At present there seems to be an either/or approach to both forms of natural gas rather than looking at the merits of both forms depending on the job at hand and the truck being used. The good thing about CNG is that as a largely unrefined gas it's cheap, safe and easy to handle as well as running in the vicinity of 25 per cent cleaner than current diesels. The downside is that as a compressed gas it takes up a lot of room when stored; this can mean big storage tanks on trucks taking up a lot of chassis space. This tends to make it not so suitable for long-haul heavy-duty work where the prime mover would have to virtually be made out of gas tanks to make it a couple of thousand kilometres up the highway. 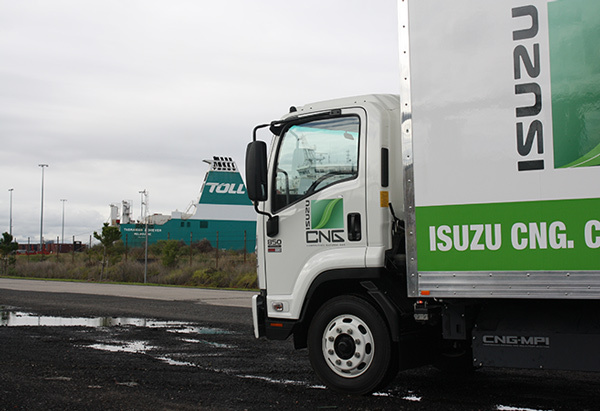 The FSR 850 CNG looked pretty innocuous sitting in the driveway of Isuzu's Port Melbourne facility, I mean apart from the fact it's covered in very politically correct green leafy CNG sign-writing. But aside from the paint job, you can't really discern a lot of differences until you start looking a bit closer. Running along the chassis under the van body there are three CNG tanks giving a total fuel capacity of 400 water litres; this is really the only visual cue that this is a completely gas-powered vehicle. The six cylinder, 7.8-litre engine uses spark ignition technology to make the pistons go up and down. This means that instead of using injectors, the 220hp (162kW) motor uses spark plugs to ignite the CNG during the combustion cycle, much the same as conventional petrol-driven engines. The gas and air mixture is formed outside the cylinder and injected into the combustion chamber using multi-point injection. As the flash point for gas is a lot higher than diesel, a spark is needed for the mixture to fire. Engineers use the term 'Stoichiometric ratio' to describe a clean burn in the combustion chamber where all fuel is burnt. In the case of the FSR the air to gas ratio is set to run on the 'rich' side, with the system injecting slightly more gas than is required, this is to prevent engine detonation, or knocking, which can cause engine damage if left unchecked. As a result, there is some methane discharged in the exhaust cycle making a three-way exhaust catalyst necessary. 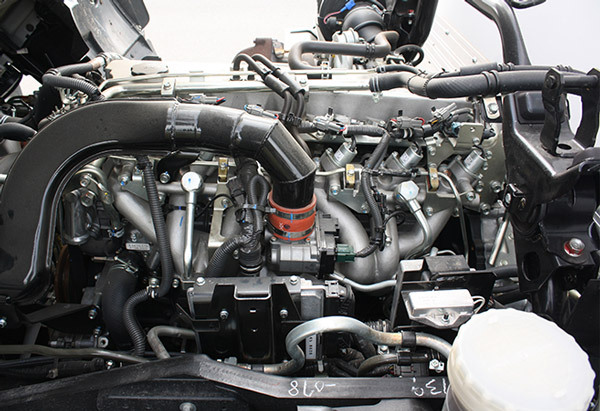 But, there is no need for an exhaust gas recirculation (EGR) or selective catalytic reduction (SCR) system to keep emissions down, with most gas engines running well inside Euro 5 ADR 80/03 levels, giving the Isuzu enhanced environmentally friendly vehicle status (EEV). To give a comparison, a litre of diesel creates 2.62kg of carbon dioxide (CO2) when burnt; a water litre of CNG creates around 2kg of CO2. The 6-speed manual transmission matched the engine output well and it wasn't often that I grabbed a gear that wasn't right for the occasion, although the gates on the shift seemed quite notchy higher up, yet vague down low in the box. The cab in the Isuzu FSR 850 CNG is comfortable despite the fact the stereo speakers are terrible. I would suggest that if a company is going to invest time and money into making the engine quieter, they might want to do something about the sound system, because now, I could actually hear how bad the speakers were. Van Halen's classic 'Panama' sounded as if it was being played through 20ft of plastic ag pipe. Behind the wheel with the engine running the most noticeable thing about the CNG engine is how quiet it is. When the engine-driven air compressor kicked in the sound was almost startling, where with a diesel engine the sound would have been lost in the background engine noise. The engine itself seemed to enjoy sitting low in the rev range, and felt quite 'torquey' at metro speed limits between 60 and 80km/h. Once I got out on the highway and fed the 850 some more gas it pulled away strongly, but almost seemed to run out of puff just before the dollar limit. Of course, this kind of truck is pretty much going to spend the bulk of its life at under 80 running around the 'burbs of the big smoke rather than sitting at highway speeds all day. Putting up with the poor quality speakers I nipped through the traffic on Princess Highway, where the low down zip of the 220hp engine made things easy and relaxed. Most drivers of metro run trucks know that the place to be for lunch is one of the many car parks that dot the eastern side of Port Phillip Bay. Lunch time found me parked atop a cliff, in the suburb of Parkdale, with the blue-green expanse of the bay stretched out before me. I had the seat kicked back and my feet on the steering wheel in true run truck driver fashion; the only thing missing was a Herald Sun newspaper across my face. After this practical demonstration of cab comfort, I hit Beach Road parading past the blue chip houses with water views, always reserving a friendly wave and a smile for any cyclists I encountered along the way. For some reason this seemed to freak them out a bit, maybe my smile was a bit manic. Next came time to refuel. There are only a couple of retail CNG outlets in Melbourne at present, one in the south eastern suburbs, and the other conveniently located at the United Service station on Grieve Parade in Altona, right near the end of Toll Drive. 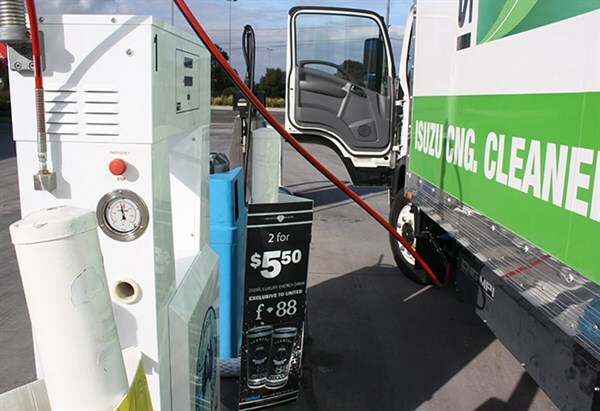 After the gloves and goggles of refuelling LNG, filling the FSR 850 CNG was almost disturbingly easy; it was simply a matter of waving my key tag in front of the card reader, entering the odometer reading, hooking the hose to the filling valve then pushing the green button on the CNG bowser. The pump then fills the tanks, beeping when they are full, then all that's required is to vent the hose nozzle, which depressurises the hose, and un-hook it, and hang it back on the bowser. The tank nozzle is hidden behind a small metal door which has an ignition lock-out micro switch on it, preventing a driver from roaring off down the road with a CNG pump bouncing along behind them. When the filler door is open, the truck won't start. On the whole the refuelling process was cleaner, quicker, easier and less smelly than fuelling a diesel. For the day, I travelled 131km around town and used 26.27kg of CNG at a retail price of 75 cents per kilogram, the entire day's run had cost $19.70, pretty cheap trucking for a 14-tonne gross vehicle mass (GVM) vehicle. Okay, the truck isn't exactly a rocket ship but it was certainly no slouch either, proving easy enough to punt through the metro traffic, and the standard FSR 850 cab is comfortable enough, stereo speakers excluded. What does remain to be seen is how the future market for these vehicles will play out. Even if retailers do start to invest in more CNG/LNG outlets, how many operators are going to be willing to take a punt on a dedicated gas vehicle? In a market where smaller companies tend to order new trucks for the next owner, will these vehicles have second and third life uses? And of course, will the Federal Government be able to resist finding a way to tax natural gas as an automotive fuel? Certainly the FSR 850 CNG is perfect for running around town in back-to-base operations and, with a big company like Toll Ipec, will probably see many years of service, meaning resale isn't as much of an issue. While the fuel cost benefits of CNG are readily available now, the biggest selling point of natural gas in the future will most likely be the lack of emissions. Carbon pricing may still be on the horizon for the transport industry, but it will arrive, and models like Isuzu's FSR 850 CNG may well become very attractive indeed. • Easy to refuel, no mess, no fuss. • Very quiet on the road with very little drive train noise. • Comfortable, practical cab, great driver's seat. • Gear-shift a bit notchy in places, vague in others. 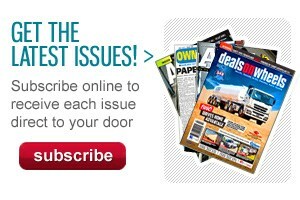 • Performance lacklustre at highway speeds.